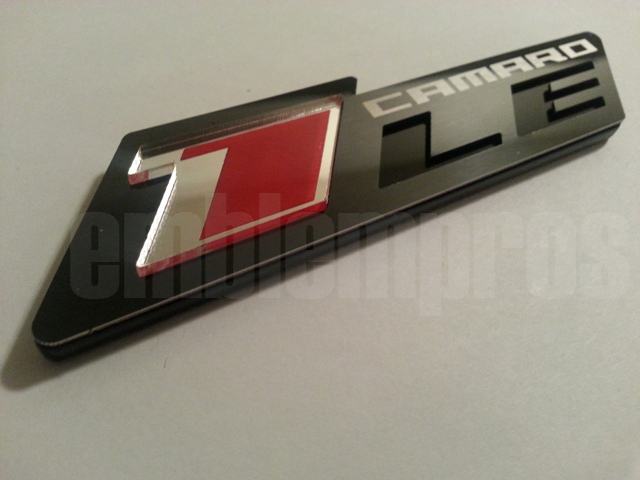 1LE 'ZR1' STYLE ONYX STAINLESS STEEL & ACRYLIC EMBLEM for your Camaro. Made from premium black mirror Stainless Steel - our ONYX Series) - and UV rated Acrylic. 3M automotive emblem tape preapplied for easy installation. You have your choice of color for the "1" and also your choice of logo from below. Size 1.2" x 5" apprx. The "1" protrudes from the face of the emblem, and the "LE" is recessed and is gloss black in color. On the inserted "1", we can color the reverse side of some of the materials. The picture above has a silver "1" with a red colored inlay. This combination of color schemes only works with certain colors. We have made the common choices available below for a slight upcharge due to extra machine time and painting/assembly. If you are interested in a color setup not selectable below, please email us and we'll see what we can do. 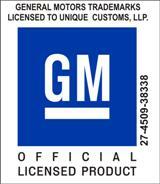 We can etch a GM logo or text of your choosing above the "LE" section as seen in the photos. This is done in a permanent satin silver finish. If you choose to enter custom text, there is a 12 character limit. We can also do a carbon fiber insert behind the "LE". The option is available below. The ZR1 Style emblems are made from a dual layer stainless, acrylic assembly. These pieces are very sturdy, and strong, and will last a very long time. Placement of the pieces is best on a flat surface because they are not easily bent. It is possible to slightly pre-bend them a little, but curved surface placement must be considered carefully. These pieces can be placed on a SLIGHTLY curved surface only. *Includes 1 1LE "ZR1" style emblem.